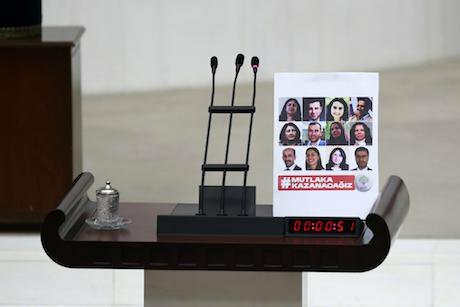 A placard with photos of 11 jailed pro-Kurdish Peoples' Democratic Party, HDP, lawmakers, left by Leyla Birlik, a HDP lawmaker after her address to the Turkish parliament on Jan. 19, 2017. Picture by AP/Press Association Images. All rights reserved. In the aftermath of the July 2016 coup d'état attempt in Turkey, president Recep Tayyip Erdoğan’s Justice and Development Party (AKP) has dismissed, detained and in some cases imprisoned co-mayors from 51 majority Kurdish local authorities across South East Turkey (North Kurdistan), replacing them with appointees from the AKP. The majority of these co-mayors belong to the AKP’s leading opposition parties, the People’s Democratic Party (HDP) and its Kurdistan branch the Democratic Regions Party (DBP). One of the initial steps taken by the AKP-appointees was to remove the administrative staff and replace them with law enforcement officers. These actions should be understood within the context of Ankara’s abject fear of widespread resistance in Kurdistan, and signal an ominous future for democracy in Kurdistan and across Turkey. Many fear that the AKP will utilise this time to destroy the social and cultural projects initiated under the HDP/DBP administration. Across Kurdistan today, the Turkish state openly appears as an occupying power.